While proclaiming and defending the Bible’s truth and authority, they show how the history it contains connects to the real world. These types of presentations are renowned for strengthening the faith of believers, as well as equipping and motivating them to reach out to others. The speakers are always available to answer people’s questions. A fully-accredited CMI speaker can feature as a guest speaker, i.e. taking the regular ‘sermon spot’ at one of your normal worship services. This often has the greatest impact of all our types of meetings, as the average churchgoer is suddenly impacted as to how the origins issue connects to the Gospel of Christ and real-world issues facing Christians today. Our speakers can address your congregation at a regular service, and because we visit a wide range of churches you can be sure that we’ll be sensitive to your needs. These talks are widely acclaimed as eye-opening, entertaining and also very motivating as our speakers use vivid multimedia presentations. An innovative, and increasingly popular, program that adds to either a morning or evening service. The speaker gives a further talk or has a question time after the conclusion of the service (after a break of say 30 minutes). This allows folks to have some of those burning questions answered (e.g. ‘what about the dinosaurs?’) that may have been raised during the initial presentation. While still at a layman’s level, it provides a slightly deeper explanation of some of the issues. It’s often helpful to arrange a fellowship meal as part of the program. These provide great outreach opportunities as they are not conducted during normal church services. They also offer opportunity for an intensive time of equipping. DVDs projected onto a large screen can also be used to create variety if required. Meetings can be held on weeknight evening(s), for example, or the range of options could provide for a Friday evening (plus all day Saturday) or just a Saturday, for example—morning, afternoon, or both. Church breakfasts are also a great way to introduce non-churched folk to this subject, and thus, the Gospel. There are a number of options available to suit your church’s needs. 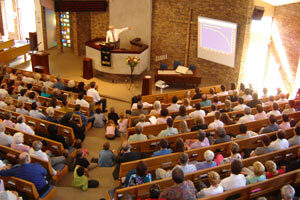 Creation Ministries International can provide speakers for church family camps and conferences. These are becoming more popular because of the opportunity gained for one-on-one interaction with a creation expert over an extended time. 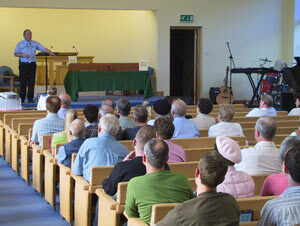 CMI has always had a strong ‘heart’ for smaller communities and churches, which often miss out on visiting speakers. That is why, for 17 years till its honourable retirement in 2009, CMI-Australia had the Creation Bus ministry, and still has the unique ministry of Rod and Nancy Walsh in the ArkVan. Basically a mobile home complete with spectacular scale models of Noah’s Ark, its visual displays powerfully dispel the myth that the account of the great Flood is some sort of fairy story. Rod is an engaging speaker who can appeal to all ages, and has also engaged in very effective tours overseas. Also, whatever country you are in, if you are in a small situation, let us know if your church is keen on ministry in your area, as we can sometimes fit it together with other ministry nearby, even if there is no dedicated travelling ministry coming through. Biblical Foundations (Australia & US only) is a six session program designed to help the teaching faculties of Christian schools transform students’ thinking to equip them to impact today’s increasingly secularized and anti-Christian culture for Christ. Curriculum-integrated worldview teaching trains students to defend their Christian faith, uphold the authority of the Word of God, effectively proclaim the Gospel of Jesus Christ and become leaders in society. It will help eliminate the destructive sacred/secular divide with the integration of biblical living principles into all subject areas. The course can be presented as part of the school professional development program. A DVD screening is an entertaining way to present the creation message, especially to smaller groups such as youth nights or small groups. Check to see if a CMI representative is available in your area to do screenings. There is an extensive range of creation films on DVD. You can book a tour or participate in an upcoming tour (Australia and Canada only). Understand the geological history of an area from a biblical perspective. See the subtle evolutionary interpretations behind museum and zoo displays and how creation better explains the same facts. See our events page for upcoming tours. Our vision is to bring change through the dissemination of information, yet as a faith-funded ministry CMI has no set fees for a visiting speaker. Some churches may give an honorarium while others take up a second (love) offering, underwriting the event to a pre-agreed amount. We believe that creation ministry is an investment in the future of your church’s ability to reach the community with the Gospel. The decision regarding the amount of any financial support is generally left to the church or organization requesting the ministry. See also Linking and feeding. As an information ministry our mission is to get resource materials into the hands of Christians to equip them more fully to defend their faith. To this end, displays with a range of quality creation materials are an integral part of our ministry. The internationally renowned Creation magazine is at the forefront of creation evangelism, and experience shows that it has the greatest impact of any resource. Please note that Creation magazine has no paid advertising so that every page is dedicated to its witnessing work. Of the thousands of testimonies we’ve received over the years, the overwhelming number have come about from Christians sharing a resource with someone else. Check here for our address and phone number. Or simply fill in a request form and a member of our fully trained ministry coordination team will contact you.